We bought this rug to fit into an awkward space in our basement and it was perfect. It is a very nice rug and the price is amazing. The quality of the jute is very good. The jute is not very thin. I would recommend this rug. Living up to its nickname as the "Golden Fiber," jute is a staple in organic home decor. Hand-braided in India from natural jute and cotton fibers, our Braided Jute Collection features a variety of patterns and neutral colors that make these rugs the perfect base for any room's design. As soft as they are durable, these rugs are the perfect organic accent to any room's design. Dimensions 72.0 In. X 72.0 In. X 0.5 In. 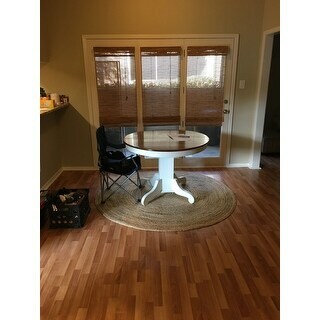 I wasn't sure that this rug would be very thick or great quality as the price was really great...however to my delight it was thick and sturdy and fits perfectly under my small dining table and chairs. Allows you to add any color to the room with it being neutral and change colors if you want from year to year! Recommend to anyone! This rug was as expected. It s in use under a round kitchen tabke. We got it for a steal. I love these natural material rugs- affordable and durable. Love this rug. Exactly what we were looking for in our kitchen. It's soft and not your normal course jute rug. We actually didn't put a pad under it and it doesn't slip on our hardwoods. We'd def reorder! This rug was very well made and the quality it great for the price. Color is exactly what It said. Initially saw this without a review listed and decided to take a chance and I have no regrets! 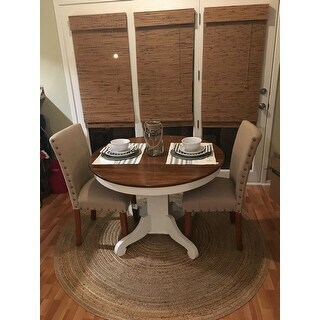 For such a great price compared to the other similar rugs on sale, this was everything I wanted! The size is perfect and the material is well made. 100% handmade at a bargain price! Very pleased with my purchase. 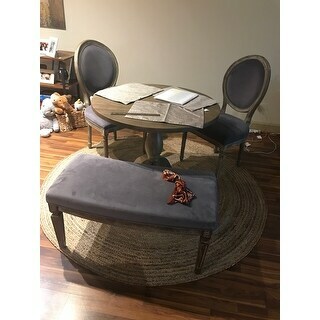 Bought this for my 42” round dining table and love it! I was worried that it would hurt my feet to walk on it but it’s really soft and laid flat almost immediately after unrolling it. Would recommend! High quality rug. Quick delivery! This rug would not lie flat after being unrolled for almost 2 weeks. The huge wrinkles make this unusable under my kitchen table.